The A to Z Challenge is moving forward. If you are here because of the challenge let me know. I spend about 20 min to an hour a day visiting the different blogs on the challenge. Today's post I am going to discuss unexpected results. 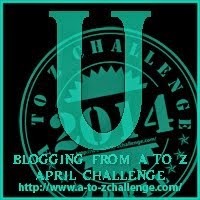 I have a link in my Chrome browser to the A to Z challenge sign up. Actually it is from the 2012 signup. Something I discovered today while catching up on my challenge visits. I found a couple of Blogs that I enjoyed reading that were not in this years challenge. I can imagine when the authors find the comments I left, they will wonder when they signed up for the challenge. Regardless, I posted yesterday my absence from the challenge because of commitments I made to non-internet friendly geographic areas. I am back now and moving on with the challenge. I hope you have found some unexpected jewels to keep up with during the challenge this year.